Did you know that all of these frightening images come not from horror movie plots, but are actual events recorded in the Bible? Nevertheless, some people just don’t listen or do what they’re told, even back in Bible times. Of course, the outcome of such disobedience is usually pretty bad. 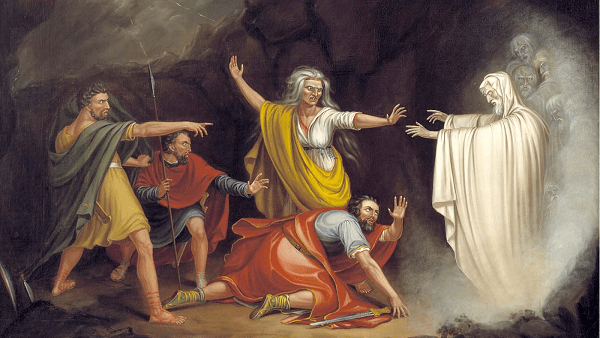 Halloween is right around the corner, and whether you celebrate it or not, it’s a good time to read the following Bible passages that feature each of the seven scary images mentioned above. Saul, the first king of Israel, had forbidden the conjuring of spirits, but he was desperate. He wanted to call up Samuel, a prophet who had died, to ask his advice. Saul consulted a witch, but she was used to dealing with a familiar spirit, a demon, and she couldn’t really call anyone back from the dead. So when Samuel actually did appear, she screamed and couldn’t believe it! Thus God will show his full displeasure against sin, so that sin is felt by the sinner in all its vile loathsomeness as a living death. The music was playing and the dancers were dancing. It was the King’s great feast with a thousand lords in attendance. The king was making merry and he called to bring forth the golden and silver vessels taken out of the temple in Jerusalem by his father, Nebuchadnezzar. When they were brought out, he, his lords, wives and concubines drank from them and praised the gods of gold, and of silver, of brass, of iron, of wood, and of stone. Suddenly, the fingers of a mysterious hand without an arm appeared and wrote on a wall. The king was so frightened that his knees began to knock together and finally gave out from beneath him. He called for the soothsayers and the enchanters and proclaimed that anyone who could interpret the handwriting would have bestowed upon them a robe, a golden chain, and would be given the position of third most powerful person in the kingdom. But none of them were able to decipher the writing on the wall. The queen heard the king’s fear and told him of a wise man named Daniel and recommended that her husband send for him. The king summoned Daniel and told him what he would be given if he could just interpret the handwriting on the wall. Daniel told the king that he could keep his riches and give his rewards to someone else, but that he would still explain the writing. Daniel first told how the king’s father Nebuchadnezzar had become so arrogant and prideful that he was stripped of his glory and given the mind of an animal, and was sent to live in the fields like a wild donkey. He remained like this until he acknowledged that the Most High God is sovereign over the kingdoms of men. You have not humbled yourself despite knowing all this that your father went through. Instead you have set yourself up against the Most High God. You had the goblets brought from His temple and used them to drink wine and to praise false gods. This is why He has sent the hand. It has written Mene, Mene, Tekel, Parsin. This means that you have been weighed in the balance and found wanting. Can you think of any other scary Bible references? Let us know in the comments below.